The Algodones Sand Dunes represent the largest sand dune system in California and the habitat is home to a number of endemic plants and animals. These dunes are also a popular destination for numerous people for recreation, camping and off-road vehicle activities. The Bureau of Land Management oversees this area and is currently circulating a new set of alternatives for public commentary regarding future recreation and conservation plans. The following beetles are endemic to these dunes, and thus are all under some threat unless sufficient natural habitat is preserved. None of these species have ever had photographs available and are presented here to engender appreciation for them. This little (ca. 3 mm length) species belongs to a small genus with 12 species distributed in arid southeastern California, western Arizona and northern Baja California. This particular species was the least common until its adult host plant preferences were discovered. It frequents flowers of Tiquilia plicata , Palafoxia arida B. Turner & M. Morris (Asteraceae) and Eriogonum deserticola S. Watson (Polygonaceae). As far as is known, this beetle is commonly found on these adult hosts around the perimeter of the Algodones dunes and the larval host plant remains unknown. Several specimens were found many years ago near Ocotillo, to the west of the Imperial Valley. Nelson, G. H. 1968. 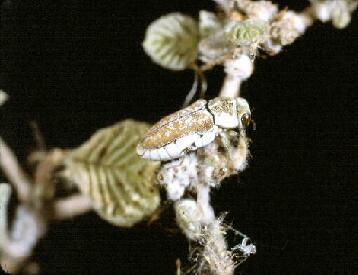 A revision of the genus Acmaeoderoides (Coleoptera: Buprestidae). Proceedings of the California Academy of Sciences , 4th series 36(6):125-146. Nelson, G. H. 1999. 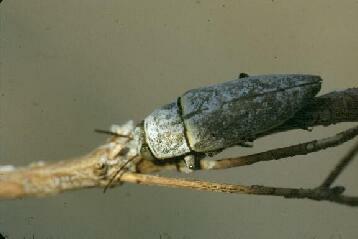 A new species and other notes on the genus Acmaeoderoides Van Dyke (Coleoptera: Buprestidae). The Coleopterists Bulletin 53(4):371-376. The most recently described endemic buprestid from the Algodones, this species is found on the foliage and likely uses Croton wigginsii Wheeler (Euphorbiaceae) as its larval host. This plant is endemic to the Algodones and is also threatened. Nelson, G. H. 1994. Agrilus harenus Nelson, a new species from southern California, with notes on A. lacustris LeConte (Coleoptera: Buprestidae). The Coleopterists Bulletin 48(3):261-264. This small (ca. 3 mm length) species is the most significant buprestid found in this habitat, since it represents a monotypic genus, only very distantly related to any other North American species. The nearest related taxa belong to the genus Eudiadora Obenberger, 1924, known only from Argentina. This little insect is collected from the flowers of Tiquilia plicata (Torrey) A. Richardson (Boraginaceae) and it only flies during the hottest time of the day, ca. 10am to 2pm in June and early July, the hottest time of the year. Despite the rather widespread nature of this adult host plant, the larval host plant remains unknown and the beetle has been collected only in and along the old canal on the west side of the dunes. Bellamy, C. L. 1991. A revision of the genus Eudiadora Obenberger (Coleoptera: Buprestidae). Proceedings of the Entomological Society of Washington 93(2):409-419. Velten, R. K. & C. L. Bellamy. 1987. A new genus and species of Coroebini Bedel from Southern California with a discussion of its relationships in the tribe (Coleoptera, Buprestidae). The Coleopterists Bulletin 41(1):185-192. This beautiful species is the largest (up to ca. 24 mm length) buprestid found in the sand dune habitat. When newly emerged the otherwise iridescent red-purple body is covered with a dense covering of white waxy powder, which provides both camouflage when it sits on sun-bleached stems and helps prevent dessication as an insulation layer. It is associated with the endemic Eriogonum deserticola S. Watson (Polygonaceae). Adults are found resting on the foliage in the early morning hours and it quickly flies when approached as the day heats up. 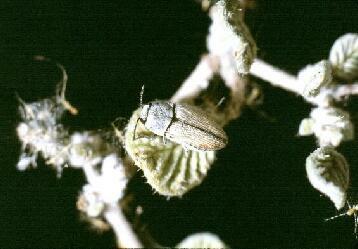 This species with its endemic host association is endemic to the Algodones dunes. Barr, W. F. 1969. New species of Hippomelas and Acmaeodera from Western North America (Coleoptera: Buprestidae). Journal of the Kansas Entomological Society 42(3):321-335. Nelson, G. H. & C. L. Bellamy. 1996. A revision of the subtribe Hippomelanina: Hippomelas Laporte and Gory, Prasinalia Casey, Gyascutus (Stictocera) Casey, and Barrellus, gen. nov. (Coleoptera: Buprestidae). Journal of Natural History 30:861-911.